Vancouver Island is known as the mecca for both salt and freshwater fishing in British Columbia. From Vancouver, you can reach some of the best salmon rivers and ocean fishing grounds in a few hours by either ferries or float planes. Vancouver Island's saltwater fishing season mainly runs from May to September. 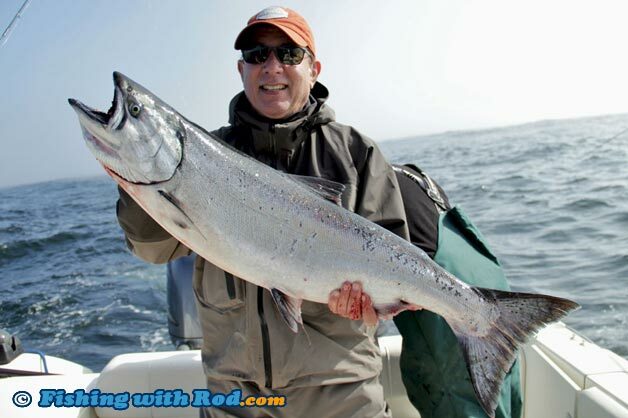 Visiting anglers can book a trip with experienced guides at any of the coastal towns such as Tofino and Ucluelet. This area offers productive fishing for chinook salmon and halibut. Other target species include rockfish and lingcod. What makes the west coast fishery so appealing is the fish sizes and quantity. Multiple fish in the 20lb+ class are the norm. In late summer and early fall, inshore boat fishing for coho, pink and chum salmon are also available. These can be targeted by a variety of techniques, including flyfishing, lure casting, jigging and trolling. Although these species are smaller, their massive returns make this fishery very exciting. Multiple and continuous hook-ups can result in a frenzy until you do not want to catch anymore fish. In Alberni Inlet, July is known for its spectacular sockeye salmon return. This fishery requires you to be on the water before dawn, but it rarely disappoints. Trolling with light tackle makes it a thrilling sport and anglers often go home happily with their limit of catches. On the east coast of Vancouver Island, beach fishing is available for those who wish to target coho and pink salmon that are staging in the estuaries. These fish are usually searching for their last meals before their spawning migration, so they can be very aggressive on the surface. Lure casting and flyfishing are the preferred methods from beaches between Parksville and Campbell River. While its saltwater fishing is legendary, its freshwater fishing should also not be dismissed. In the fall, returning salmon result in non-stop action. Campbell River, Stamp River and Cowichan River are just few of the systems that are worth trying out. Fishing does not stop when it gets cold at these watersheds. Winter steelhead fishing is available from December to April, while some rivers also offer summer steelhead fishing. If salt and moving water fisheries are not for you, then how about a relaxing outing by the lake. Vancouver Island and its nearby gulf islands have hundreds of lakes where fishing for trout and bass can be done. Two main trout species are available, they are rainbow trout and cutthroat trout. Although it is not as productive as what the Thompson-Nicola region offers, the variety makes up for it. At many Vancouver Lakes, it is possible to encounter rainbow trout, cutthroat trout and smallmouth bass during one outing. The average size of rainbow trout at most lakes is no more than 16 inches long, while cutthroat trout can sometimes reach 20+ inches. A typical island smallmouth bass is between 14 and 18 inches long. Targeting these three species on either a light spinning or fly rod can be very entertaining. What truly defines Vancouver Island's fishing experience is not its abundant fisheries, but the relaxing island lifestyle. One can spend days on "The Rock" and quickly forget all worries once being surrounded by its peaceful elements. Rivers on Vancouver Island have a long history of salmon and steelhead fishing in British Columbia. Many stories have been written about these streams. Pacific salmon return by the tens of thousands in fall, while both summer and winter steelhead are found in some systems. Well known rivers on Vancouver Island include Campbell River, Stamp River, Cowichan River and Nitnat River. Region one has both urban and remote lakes where trout and bass fishing are available for anglers of all skill levels. Its urban lakes provide consistent rainbow trout fishing between spring and fall, while smallmouth bass fishing is recognized as some of the best in this province. Remote, stream-fed lakes offer trophy rainbow and cutthroat trout fishing for anglers who are looking for a challenge. If the rough Pacific Ocean is not your cup of tea, then the East Coast of Vancouver Island may just have the saltwater salmon fishing experience that you are looking for. Beside trolling for big chinook salmon, anglers have the opportunity to catch coho and pink salmon from beaches. Rockfish and lingcod fishing is also another fun alternative that you should not miss out on. Saltwater Fishing Location Guide Coming soon! The West Coast of Vancouver Island provides the ultimate wild fishing experience in British Columbia. Surrounded by sea lions, orcas and migratory whales in the Pacific Ocean, anglers get to experience catching trophy-sized chinook salmon and halibut. Beside bountiful catches, the spectacular scenery alone is well worth the trip to this region.